As more states legalize marijuana to varying degrees, Pets Best Pet Insurance wants to make sure pet owners are aware of marijuana’s dangers to animals. Believe it or not, marijuana can cause serious illness in dogs and cats, which may be exposed to its effects either by ingesting the plant or by inhalation of smoke. While marijuana is rarely deadly to animals, it can cause serious illness in pets. 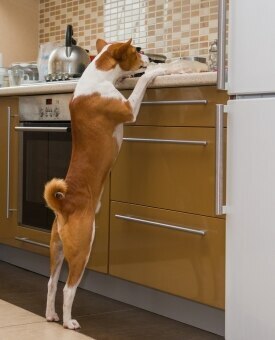 One of the most common ways animals will ingest marijuana is when it has been left out and unattended. Although this occurs more frequently in dogs, it can also happen with cats. This may happen when the plant itself has been left out, or when it has been incorporated into baked goods, which some pets find especially appealing. Beware that marijuana brownies are particularly unsafe because they include chocolate, an additional poison to dogs and cats, acting as a potent stimulant that can affect nervous systems negatively, causing illness or even death. Plus, dogs are attracted to the smell of chocolate as well as other baked goods, which makes them even more dangerous. Symptoms of marijuana poisoning can be seen in dogs and cats about 1 to 2 hours after ingestion. Dogs and cats may exhibit signs of depression, tremors, vomiting, hallucinations, hypothermia and disorientation. If a dog or cat has ingested marijuana, they need to be seen by a veterinarian right away. Typically, the veterinarian can induce vomiting, which will help rid the majority of the drug from the pet’s stomach. Do not assume that since an animal is vomiting on its own it is “fine” … the animal should still be seen immediately. In some cases, veterinarians may give the animal active charcoal to bind the drug and administer intravenous (IV) fluids to help metabolize and remove it from the body faster. Quick treatment can reduce the severity of the poisoning, which can get the animal back to a normal, healthy state faster. No matter how long it has been, however, if a cat or dog has ingested marijuana or been exposed to smoke, they need to see a vet to ensure they are getting proper treatment, which could save their lives. It is crucial to get animals who have been exposed to marijuana to the hospital, so that a veterinarian can monitor their heart rate and body temperature. Depending on their body’s response to the drug, their heart rate may be very low or very high, both of which can have life-threatening consequences. In a recent survey of U.S. veterinarians conducted by Pets Best, the third most common toxin for which veterinarians treated dogs was marijuana. While the cost of treating animals for marijuana poisoning can vary, Pets Best Pet Insurance reports that resulting claims in the last 2 years have ranged from $250 to nearly $1,200. Considering the cost of treating a dog or cat for marijuana poisoning, as well as the potential damage to the animal, it is very important to prevent poisoning from occurring in the first place. Pets Best recommends keeping marijuana away from pets (as well as children), in containers that cannot be opened by animals, on surfaces that are not accessible to them. Ideally, do not combine the drug with chocolate or other baked goods that appeal to animals, as this increases the risk of ingestion. In cases where poisoning does occur, bring the animal to the veterinarian for treatment right away, and do not try to treat the animal without expert help. The quicker the animal reaches the hospital, the better the chance of long-term health.